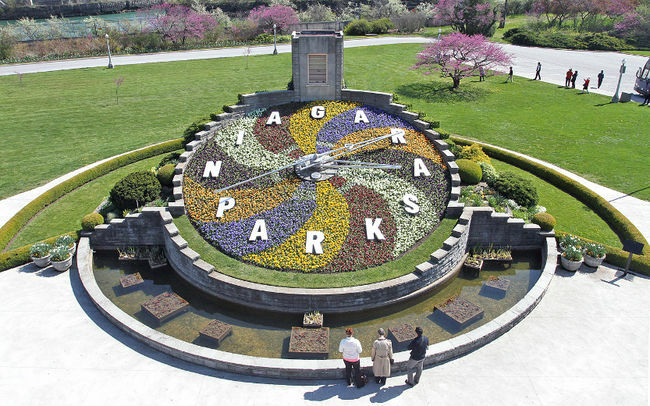 If you were to guess what the second most photographed landmark in Niagara Falls is, would you guess the Niagara Parks Commission’s Floral Clock? The Floral Clock, built in 1950, is photographed almost as much as the falls itself! Comprised of up to 16,000 carpet bedded plants, the clock’s intricate floral design is changed twice every year by the Niagara Parks Commission’s horticulture staff – once in the spring and again in late summer. The horticulture staff use viola in the spring and four cultivars of Alternanthera along with green and grey forms of Santolina Sage during the summer and fall. California Golden Privet and Blue Festuca Grass are also occasionally used for contrast. The grounds surrounding the clock feature bedding displays and a tower at the back of the clock houses Westminster chimes that greet each quarter hour. Another feature is the 10-foot wide water garden that curves 85 feet around the base of the timepiece and is a popular place to make a wish. The clock is located at 14004 Niagara Parkway, Queenston, Ontario, Canada, behind the Sir Adam Beck Power Plant and near the Lewiston-Queenston International Bridge, so make sure to stop by and see it on your next visit to Niagara!